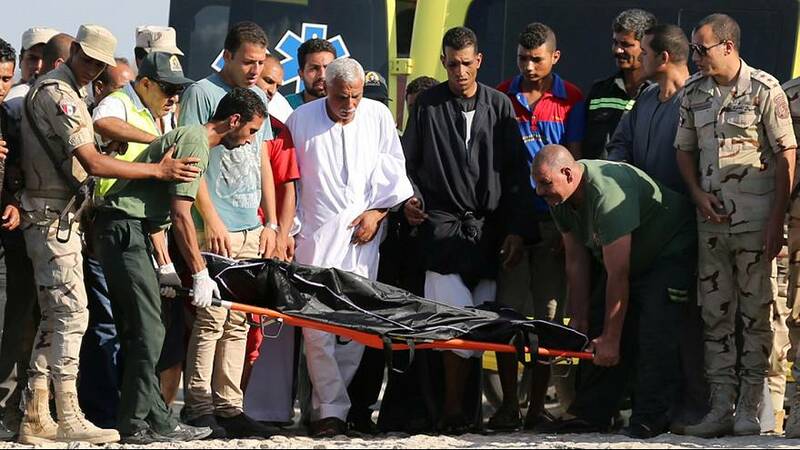 Rescuers in Egypt have pulled more bodies from the sea, two days after a boat sank as it carried migrants towards Europe. In the early morning between 20 and 30 were brought to shore by fishing boats in Rosetta (Rashid) and loaded into ambulances. By the middle of the day on Friday the total number of confirmed dead in the tragedy was approaching 150. It’s thought hundreds more are missing: the UNHCR has estimated that the boat was packed with some 450 people, while the state news agency MENA said earlier that the number of migrants might have reached 600. Of the 150 people rescued, the UNHCR said that the majority were Egyptians, while other nationalities included Sudanese, Somalians and Eritreans. In the town’s hospital survivors have been telling Euronews their stories. “I found (the body of) a kid floating in the water, so I tied him to the belt of my trousers. I decided to carry him for fear that his body would be lost forever. His light weight didn’t feel like a burden on me in the sea, so I decided to hold onto him till the end,” said one young man, Ahmed Darweesh. Some of those in hospital are handcuffed to their beds because they are under investigation by the Egyptian police, who suspect they may be people smugglers – or may be able to provide information. At the very least they may be accused of trying to leave the country illegally. Four suspected traffickers have been arrested. Meanwhile relatives of the missing waited for news, filling a pier just outside the town, crowding around the ambulances in an attempt to identify the bodies.